If you’d like more information about rehomed greyhounds, contact Lincolnshire Greyhound Trust. Lincolnshire Greyhound Trust has rehomed over 1,700 dogs. You can see a full list of all greyhounds rehomed by our group by clicking the link below. 1. Daphs Rascal (Daph) born 21 June 2015, rehomed 1 January 2019 to a lady in Halifax. 2. Well Reem (Benji) born 12 June 2014, rehomed 2 January 2019 to a family in Walthamstow. 3. Shaneboy Russell (Russell) born 17 August 2014, rehomed 4 January 2019 to a lady near Grimsby. 4. Clares Farley (Charlie) born 9 September 2012, rehomed 5 January 2019 to a family near Retford. 5. Matts Messi (Messi) born 14 May 2011, rehomed 12 January 2019 to a couple in North Lincolnshire. 6. Global Scally (Floyd) born 10 September 2012, rehomed 13 January 2019 to a family in Caistor. 7. Woodbrook Legend (Woody) born 28 June 2013, rehomed 16 January 2019 to a couple in Barton upon Humber. 8. 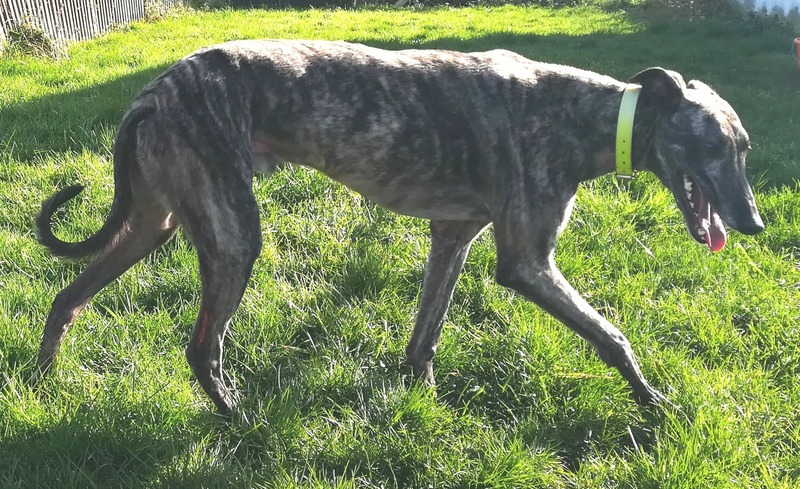 A Game Changer (Gareth) born 4 November 2015, rehomed 19 January 2019 to a couple near Aylesbury. 9. 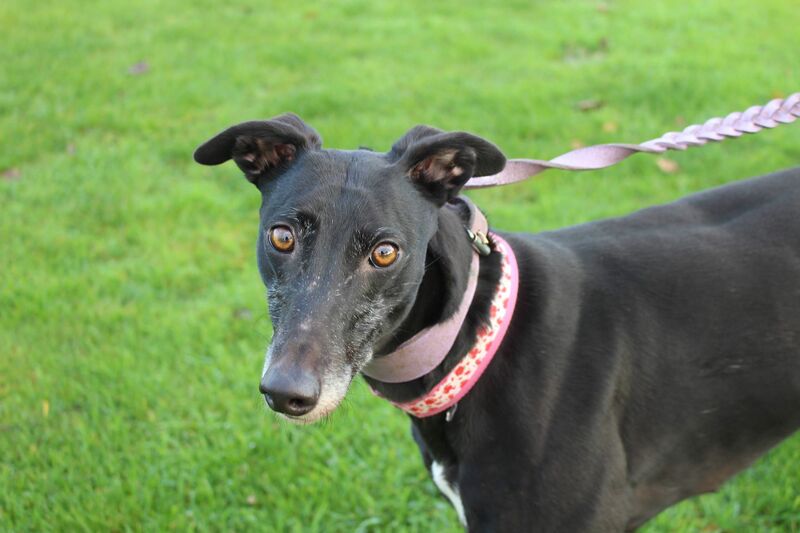 Tullymurry Dame (Dame) born 2 February 2010, rehomed 20 January 2019 to a couple from Scunthorpe with one other greyhound. 10. 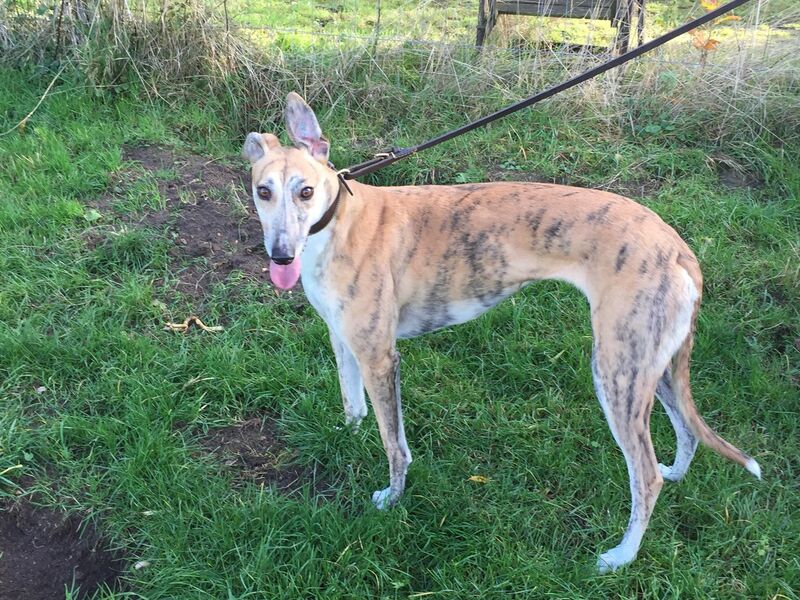 Ballymac Misty (Misty) born 7 July 2014, rehomed 20 January 2019 to a lady near Scarborough with a lurcher, 3 cats and 4 hens. 11. Dunbolg Jason (Jason) born 23 September 2015, rehomed 25 January 2019 to a man in North Weald. 12. Special Sunshine (Paris) born 29 March 2015, rehomed 25 January 2019 to a family in Wickford. 13. Unregistered male (Solo) born April 2016, rehomed 1 February 2019. 14. 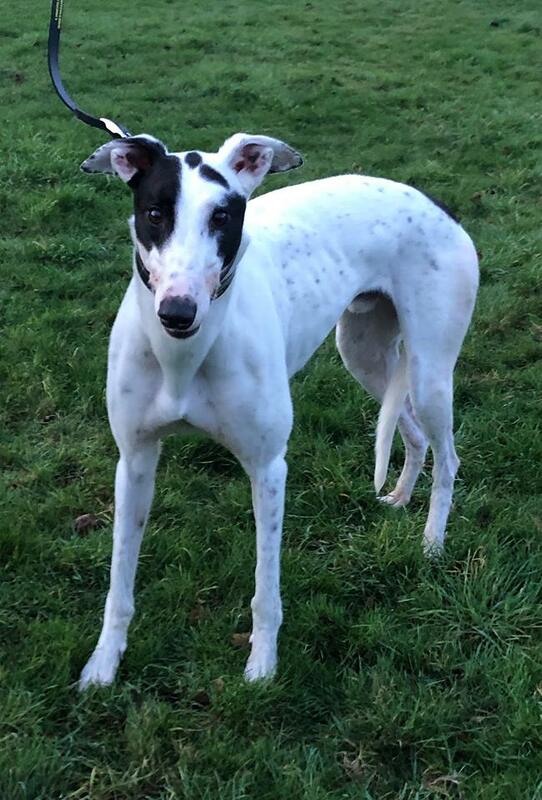 Bunny’s Money (Bugsy) born 4 October 2015, rehomed 2 February 2019 to a family near Spalding with one other greyhound. 15. 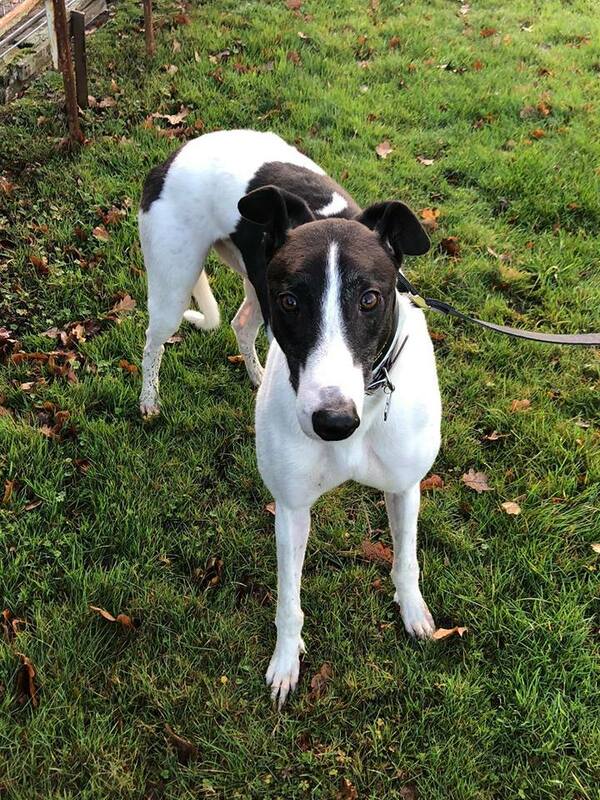 Da Connemara Kid (Gavin) born 21 April 2016, rehomed 3 February 2019 to a family in Didcot with one other greyhound. 16. Hellfire Lady (Flo) born 16 May 2015, rehomed 3 February 2019 to a couple near Grantham with 2 other dogs, 4 cats and 2 ferrets. 17. Corrin Boyshane (Shane) born 11 August 2014, rehomed 9 February 2019 to a family in Lewisham. 18. 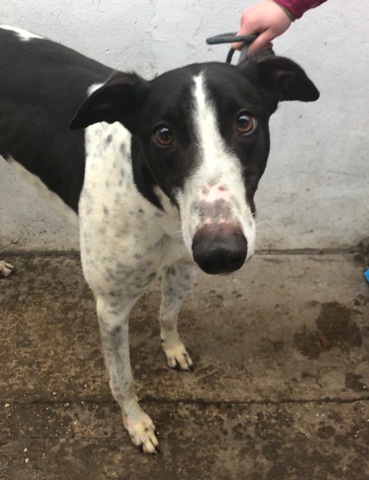 Droopys Harrison (Harri) born 19 January 2015, rehomed 10 February 2019 to a lady in North Weald. 19. To Tone Frank (Frank) born 2 September 2013, rehomed 15 February 2019 to a family near Doncaster with a weimaraner. 20. Ballymac Harbour (Captain) born 1 September 2016, rehomed 15 February 2019 to a family near Lincoln. 21. 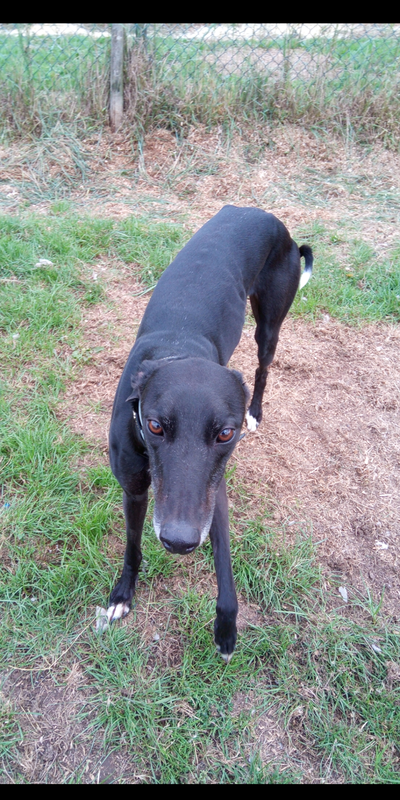 Old Time Melody (Blackie) born 14 February 2013, rehomed 17 February 2019 to a lady near Mablethorpe with one other greyhound. 22. Courtwood State (Woody) born 9 September 2008, rehomed 17 February 2019 to a couple near Norwich. 23. 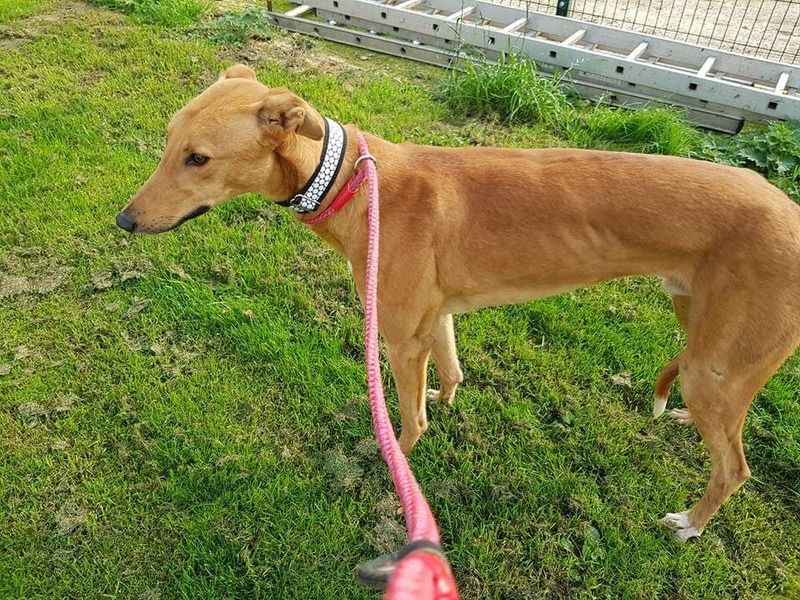 Belvoir Bay (Georgie) born 29 June 2014, rehomed 22 February 2019 to a family near Oakham with one other greyhound. 24. Robbing Who (Robin) born 15 October 2015, rehomed 23 February 2019 to a family in Wigan with a small dog and a cat. 25. Launch It Rambo (Bo) born 15 May 2015, rehomed 24 February 2019 to a family near Reading. 26. Special Stride (Mae) born 15 May 2016, rehomed 1 March 2019 to a family in Chesham with a cat. 27. Skyflying Rudee (Rudee) born 9 December 2016, rehomed 2 March 2019 to a family in Stevenage. 28. 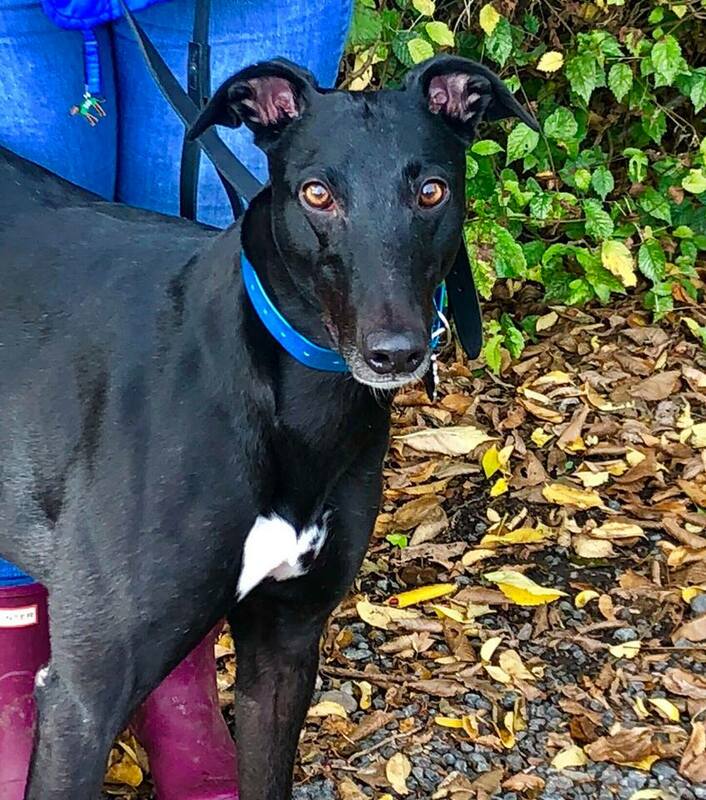 Amazing Jungle (Jungle) born 2 June 2012, rehomed 2 March 2019 to a lady near Brighton with one other greyhound. 29. Ashfield Paidi (Rambo) born 9 October 2015, rehomed 6 March 2019 to a couple near Spalding. 30 Jacks Reply (Jack) born 1 October 2013, rehomed 9 March 2019 to a man in Oxfordshire. 31. 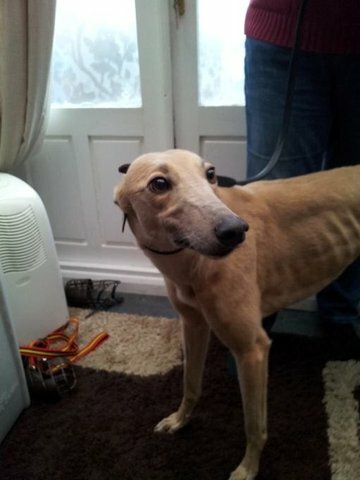 Sneezys Bobby (Bobby) born 14 November 2011, rehomed 9 March 2019 to a lady near Market Rasen with two other greyhounds. 32. Madabout Tiger (Leo) born 12 April 2017, rehomed 10 March 2019 to a couple in Loughton with a young daughter. 33. 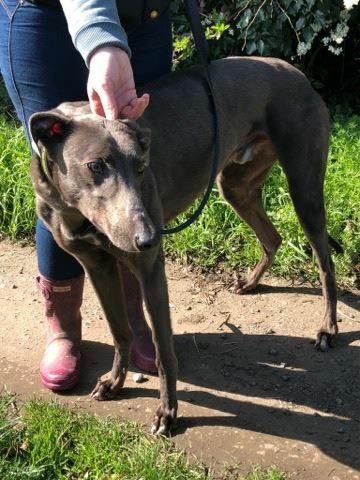 Special Pace (Arthur) born 15 May 2016, rehomed 15 March 2019 to a family near Nottingham with a cat. 34. Cotton Pants (Bolt) born 7 July 2014, rehomed 20 March 2019 to a family near Sleaford. 35. 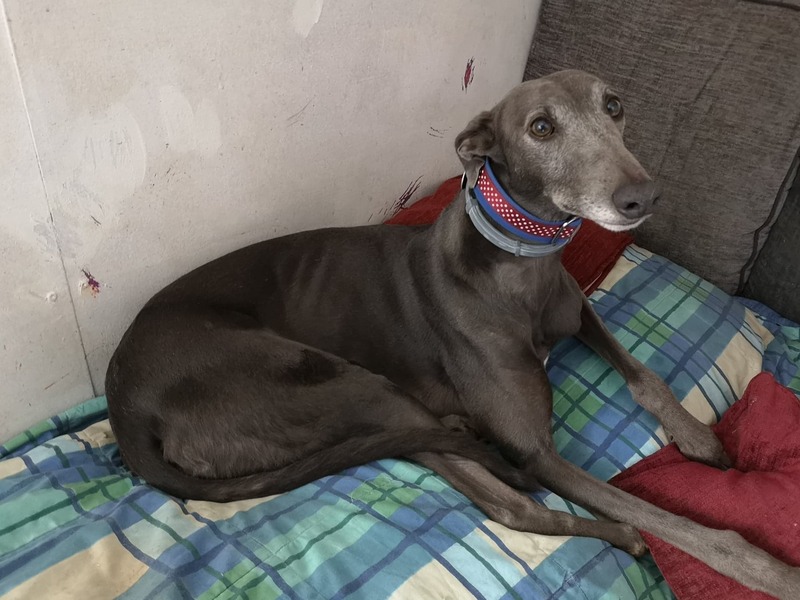 Special Fli (Fli) born 29 March 2015, rehomed 21 March 2019 to a lady in Hemel Hempstead. 36. Geelo Summer (Tinks) born 1 May 2016, rehomed 25 March 2019 to a couple in Ashbourne with two cats. 37. 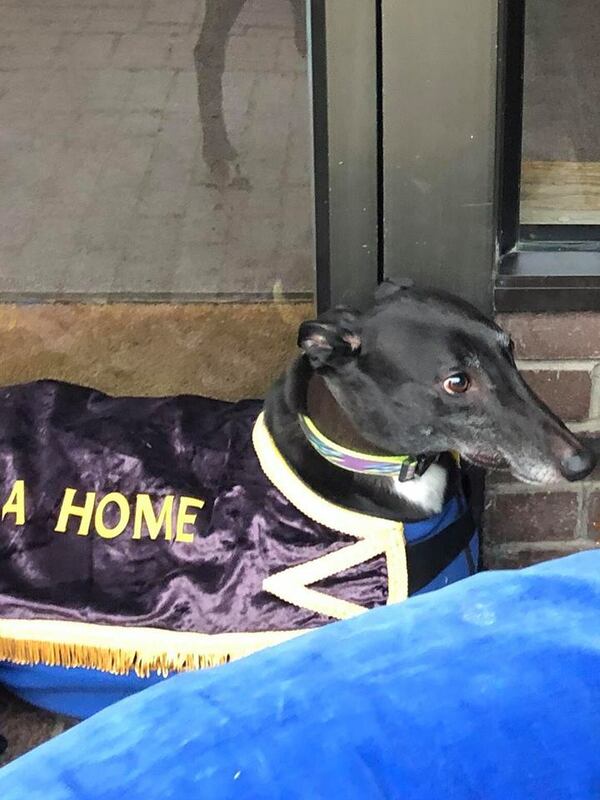 Mineola Hurry (Zat) born 9 March 2011, rehomed 26 March 2019 to a couple in Boston with one other greyhound. 38. 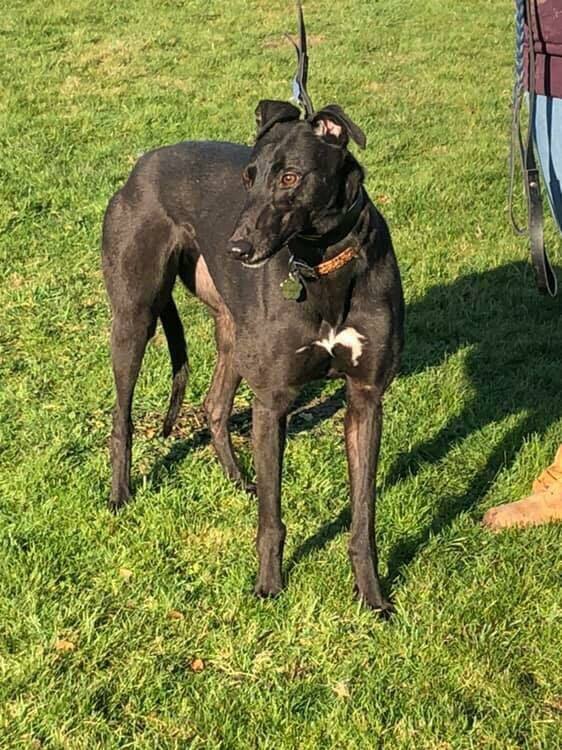 Night Covers All (Ernie) born 14 July 2016, rehomed 30 March 2019 to a couple near Lincoln with one other greyhound and 4 cats. 39. Fizzypop Bob (Bobby) born 17 January 2017, rehomed 30 March 2019 to a family in St Albans. 40. 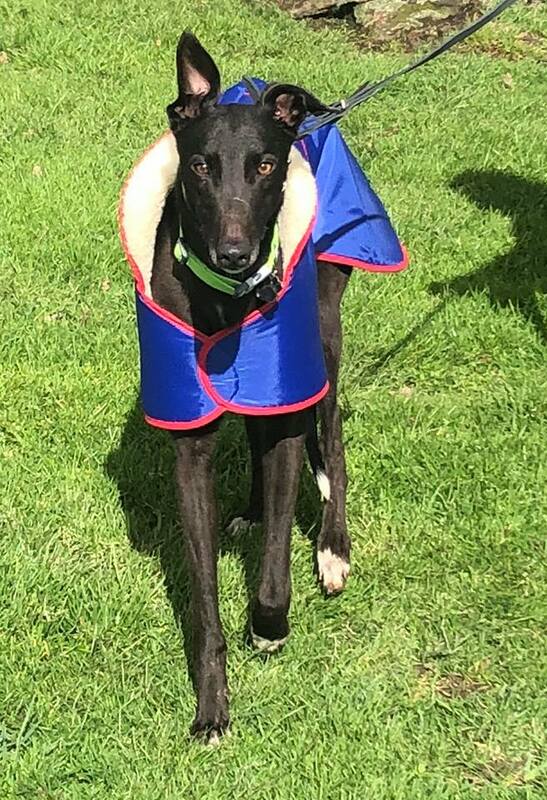 Canine Clown (Paul) born 22 November 2015, rehomed 3 April 2019 to a family near Sleaford. 41. Unregistered female (Willow) born 5 April 2012, rehomed 4 April 2019 to a family in Cleethorpes with a cat. 42. 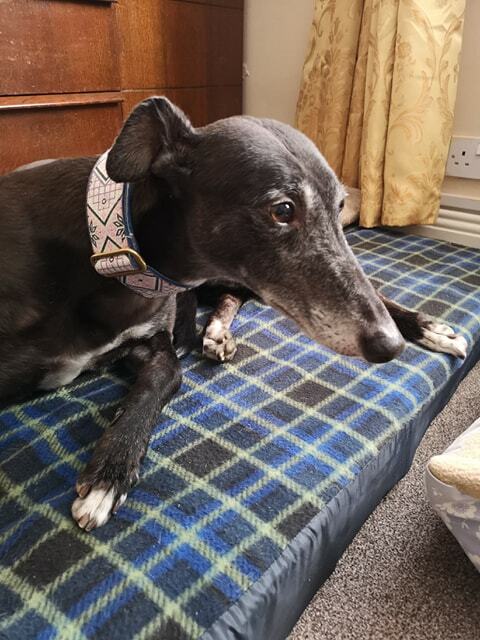 Canine Charm (Heidi) born 14 July 2016, rehomed 4 April 2019 to a family near Sleaford with one other greyhound and a cat. 43. Chiltern Robin (Robin) born 18 May 2015, rehomed 12 April 2019 to a family in Billinghay with a cat. 44. Druids Say When (Samson) born 7 August 2015, rehomed 12 April 2019 was to a retired lady in Ware with 6 cats. 45. 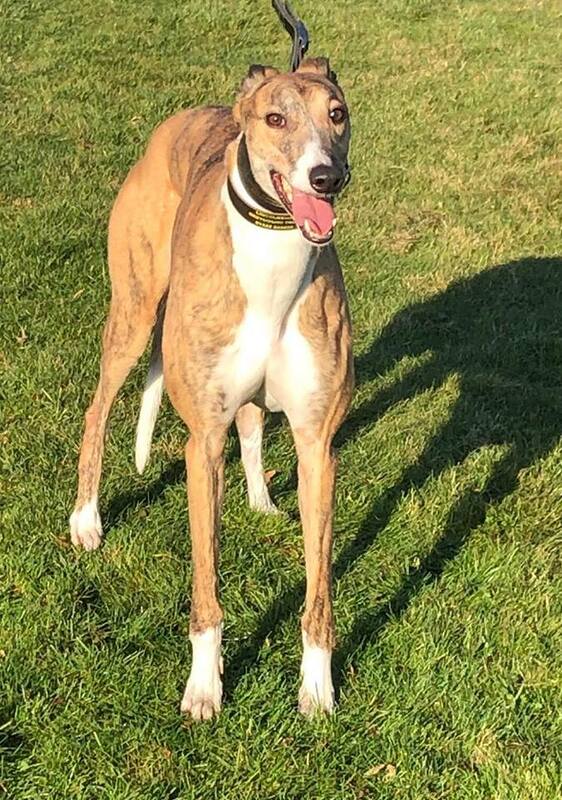 Ballymac Killown (Herbie) born 3 September 2015, rehomed 17 April 2019 to a family near Spalding with 3 other greyhounds and 3 cats. 46. Head Iton Carl (Carl) born 30 August 2013, rehomed 19 April 2019 to a lady in York with a 17 year old daughter. 1. Uh Oh Chongo (Charlie) born 2 August 2010, rehomed 4 January 2018 to a couple near Brigg. 2. North West Cup (Toby) born 1 July 2014, rehomed 6 January 2018 to a couple from Nottingham. 3. Carden Punch (Belle) born 16 October 2013, rehomed 7 January 2018 to a man and adult son near Oxford. 4. Shreyas Rani (Lila) born 5 April 2014, rehomed 7 January 2018 to a couple from Sleaford. 5. Razor De Monet (Lily) born 6 November 2014, rehomed 12 January 2018 to a couple near Banbury. 6. Primo Lighting (Freya) born 9 February 2014, rehomed 12 January 2018 to a lady in Bicester. 7. Hollyoak Shakira (Kira) born 7 December 2012, rehomed 17 January 2018 to a lady in Lincoln. 8. Meenagh Speedy (Speedy) born 19 September 2013, rehomed 20 January 2018 to a couple in Boston with 3 cats. 9. Glamour La La (La La) born 20 March 2012, rehomed 21 January 2018 to a lady in Lincoln. 11. Zari Magic (Zara) born 11 December 2015, rehomed 28 January 2018 to a family near Oakham with one other greyhound. 12. Miss Blitz (Blitzy) born 17 August 2012, rehomed 29 January 2018 to a family in Grimsby with a bichon fries. 13. Ashbank Meg (Meg) born 28 October 2015, rehomed 3 February 2018 to a family from Scunthorpe. 14. Its Mine (Tiny) born 8 June 2013, rehomed 9 February 2018 to a couple from Holbeach. 15. Geelo Scolari (Sully) born 10 August 2015, rehomed 9 February 2018 to a family from Gainsborough. 16. Musical Sundance (Sammy) born 14 August 2015, rehomed 11 February 2018 to a lady in Stevenage with a border collie. 17. La Dash Comet (Tom) born 17 September 2014, rehomed 15 February 2018 to a family near Lincoln. 18. Diego Flight (Diego) born 4 March 2013, rehomed 22 February 2018 to a couple in Horncastle. 19. Chipotle Morita (Mo) born 7 October 2015, rehomed 23 February 2018 to a family in North Oxford. 20. Erkinas Hawk (Ricas) born 8 May 2012, rehomed 23 February 2018 to a man near Oxford. 21. Black Alder (Albert) born 14 September 2013, rehomed 24 February 2018 to a couple in Nottingham. 22. 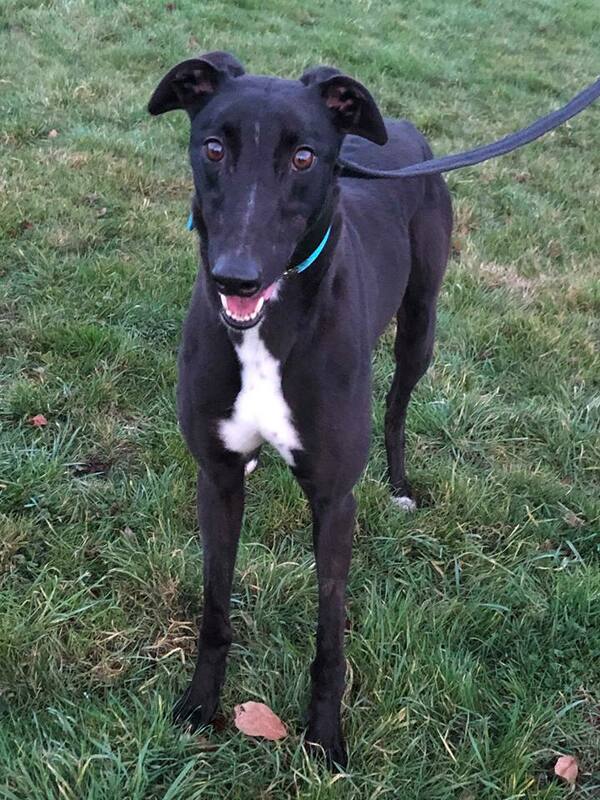 Droopys Cortez (Tez) born 2 November 2012, rehomed 24 February 2018 to a couple near Holbeach with a Golden Retriever. 23. Mumhan Alainn (Milly) born 1 January 2014, rehomed 25 February 2018 to a lady in Thame. 24. 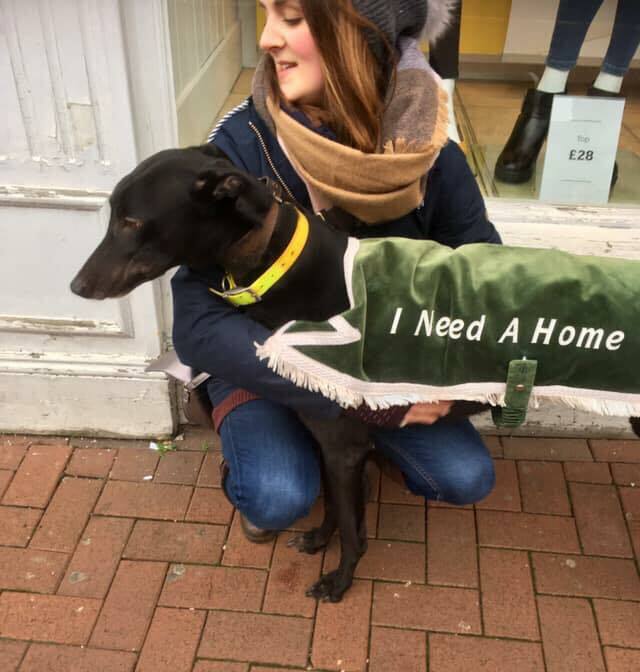 Surfing Joe (Joseph) born 17 September 2015, rehomed 25 February 2018 to a couple near Brigg with three other greyhounds. 25. Adageo Gold (Diego) born 13 October 2014, rehomed 10 March 2018 to a couple in Bourne. 26. Fantasy (Jaxx) born 26 October 2015, rehomed 10 March 2018 to a family in Sittingbourne. 27. Coolavanny Bisto (Bisto) born 4 October 2013, rehomed 12 March 2018 to a family near Spalding. 28. Foleys Bullet (Thomas) born 3 June 2014, rehomed 13 March 2018 to a couple near Boston. 29. Head Iton Bigian (Ian) born 23 August 2013, rehomed 15 March 2018 to a couple in Cleethorpes with a small dog. 30. Boom Boom Sully (Sully) born 27 August 2012, rehomed 17 March 2018 to a couple in Metheringham with adult daughter and two cats. 31. Fabulous Passage (Sage) born 10 June 2008, rehomed 18 March 2018 to a lady in Lincoln. 32. To Tone Lexi (Lexi) born 1 January 2013, rehomed 18 March 2018 to a lady near Lincoln with a cat. 33. Geelo Spectre (Bow) born 23 September 2016, rehomed 24 March 2018 to a family from Rotherham with a Jack Russell and a Spaniel. 34. Time To Rise (Dora) born 2 June 2015, rehomed 25 March 2018 to a couple in Saxilby with an adult daughter. 35. Lincolns Topgirl (Susie) born 23 July 2008, rehomed 31 March 2018 to a lady in London. 36. Head Iton Sandy (Sandy) born 23 August 2013, rehomed 2 April 2018 to a couple near Milton Keynes with a 12 year old son. 37. Agincourt Apex (Alfie) born 1 July 2014, rehomed 4 April 2018 to a couple in Immingham. 38. 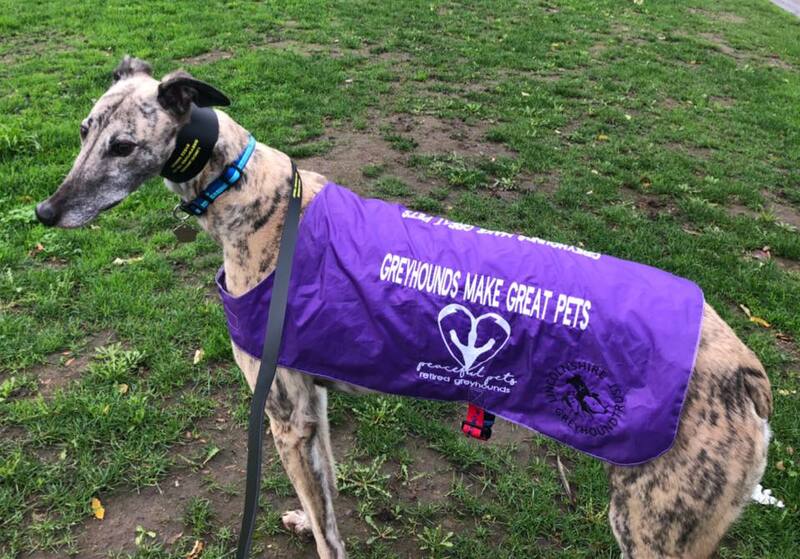 Geelo Onesie (Onesie) born 8 August 2014, rehomed 4 April 2018 to a family near Boston with one other greyhound and a cat. 39. 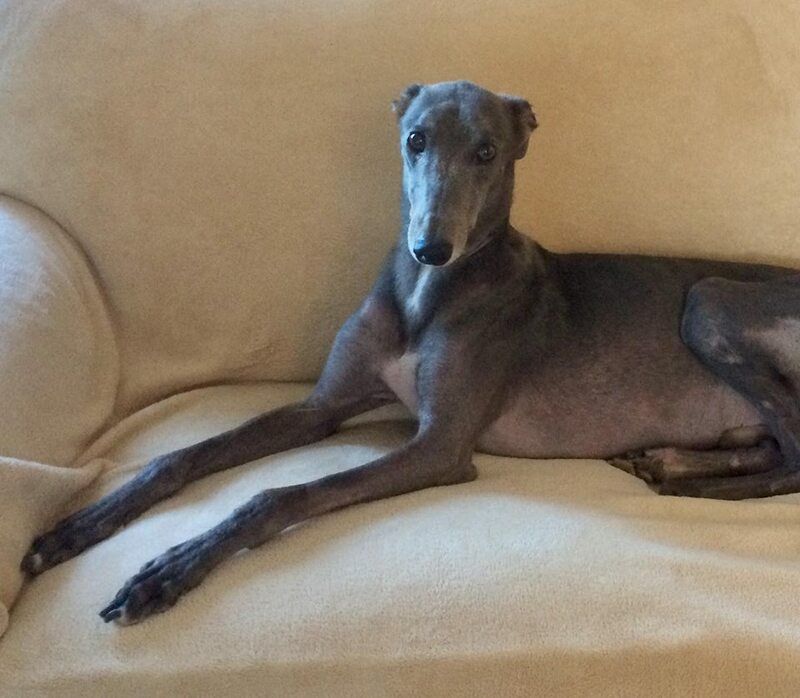 Georgia Peach (Mitch) born 19 December 2011, rehomed 6 April 2018 to a couple in Boston with two other greyhounds. 40. Black Hill Lark (Erik) born 1 September 2013, rehomed 10 April 2018 to a couple in Metheringham with one other greyhound. 41. Champagne Phylis (Tia) born 11 August 2014, rehomed 13 April 2018 to a retired couple near Bourne with another dog and a cat. 42. Gerrys Guinness (Bonnie) born 3 March 2015, rehomed 13 April 2018 to a couple from Walthamstow. 43. Ballylark Bolt (Alfie) born 2 March 2016, rehomed 18 April 2018 to a family near Sleaford with a cat. 44. Mustang Vortex (Storm) born 24 June 2012, rehomed 21 April 2018 to a lady from Grimsby. 45. Billis Beauty (Billi) born 16 December 2012, rehomed 27 April 2018 to a family near Lincoln with one other greyhound. 47. 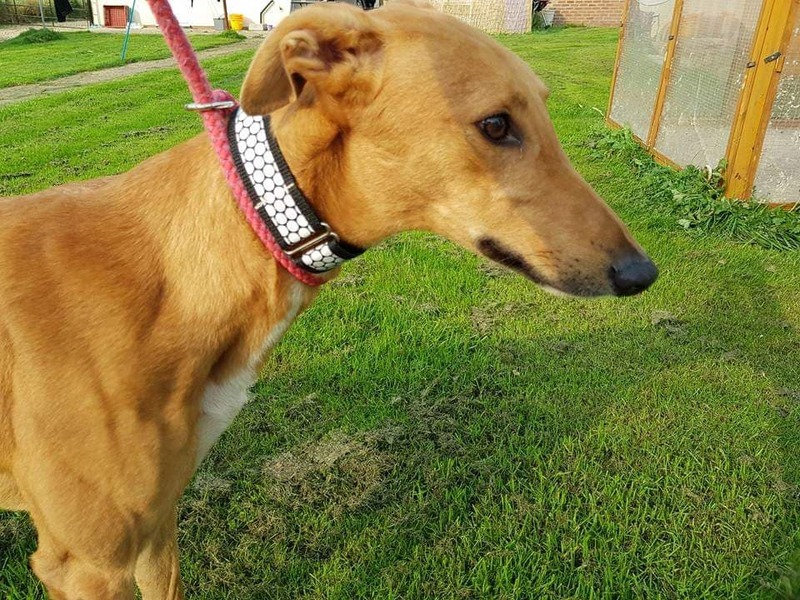 Madabout Shell (Shell) born 13 September 2015, rehomed 28 April 2018 to a family near Lincoln with one other greyhound and two cats. 48. Unregistered male (Kenco) born 9 May 2016, rehomed 28 April 2018 to a family from Newbury. 49. Theos Rocket (Theo) born 2 August 2015, rehomed 29 April 2018 to a couple in North Lincolnshire. 50. The Other Star (Star) born 1 November 2013, rehomed 29 April 2018 to a couple in Staffordshire. 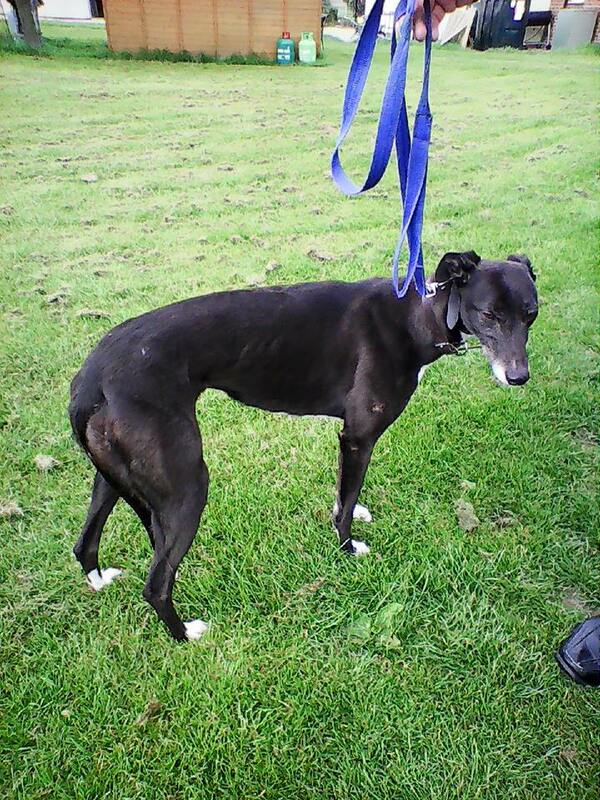 51 Fabulous Escape (Kizzy) born 2 January 2014, rehomed 29 April 2018 to a couple in Brigg with one other greyhound. 53. Inniskeen Jet (Dudley) born 8 December 2015, rehomed 6 May 2018 to a family in Soham with three cats. 54. Land Down Under (Mandy) born 22 November 2013, rehomed 6 May 2018 to a couple near Boston. 55. Bush Hill Murry (Minty) born 13 October 2015, rehomed 6 May 2018 to a family just north of London. 56. 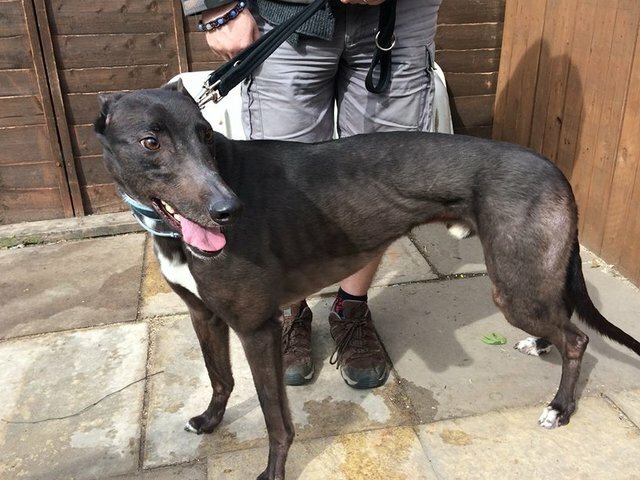 Castlegore Jet (Jet) born 9 June 2012, rehomed 9 May 2018 to a man in Lincoln. 57. Dunham Brien (Ian) born 21 September 2014, rehomed 15 May 2018 to a family near Gainsborough with three other dogs. 58. Blackthorn Ace (Ace) born 17 March 2012, rehomed 16 May 2018 to a lady in Cheshire. 59. Narabane Rosie (Rosie) born 1 September 2013, rehomed 19 May 2018 to a family in Scunthorpe with one other greyhound. 60. Jacobs Joe (Joe) born 1 December 2013, rehomed 25 May 2018 to a couple near Scunthorpe with two other greyhounds. 61. 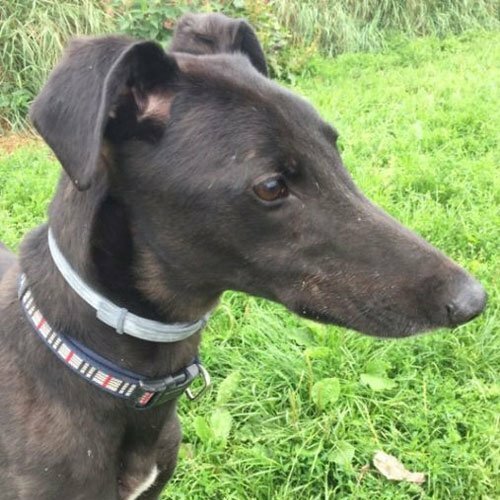 Swift Clare (Clare) born 5 May 2014, rehomed 25 May 2018 to a couple in Stamford with one other greyhound and a cat. 62. Primo Lexus (Lexus) born 9 February 2014, rehomed 26 May 2018 to a family in Buckinghamshire with a wolfhound. 63. Tyrian Bolt (Bolt) born 17 March 2015, rehomed 31 May 2018 to a family near Grantham with a cat. 64. Nextop Rocket (George) born 1 March 2016, rehomed 3 June 2018 to a family in Chesham. 65. Water Fern (Walter) born 14 September 2013, rehomed 4 June 2018 to a family in Scunthorpe. 66. Whiteys Impact (Billy) born 14 October 2013, rehomed 7 June 2018 to a man in Lincoln. 67. 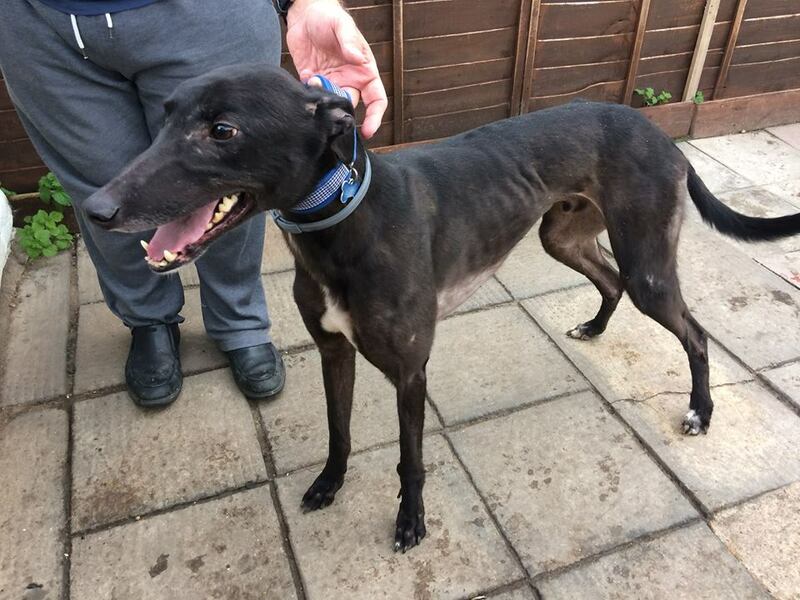 Braemore Rocket (Kerry) born 19 August 2012, rehomed 10 June 2018 to a couple near Wragby with one other greyhound. 68. Charlston Hot (Charlie) born 7 October 2015, rehomed 13 June 2018 to a family in Maidenhead. 70. Druids Bargy Man (Bhaji) born 7 August 2015, rehomed 22 June 2018 to a family in Epping. 71. Special Trixi (Trixi) born 1 October 2013, rehomed 2 July 2018 to a couple in Chingford. 72. The Lovely One (Nala) born 14 October 2015, rehomed 2 July 2018 to a family in Sleaford with one other greyhound, a spaniel and a cat. 73. Mineola Hurry (Zat) born 9 March 2011, rehomed 3 July 2018 to a lady near Lincoln. 74. Headford King (Spot) born 2 March 2015, rehomed 4 July 2018 to a couple near Doncaster. 75. Glen Princess (Jessie J) born 11 July 2016, rehomed 8 July 2018 to a family in Spalding with two cats. 76. Roswell Iceman (Iceman) born 1 December 2013, rehomed 28 July 2018 to a couple in Spalding with a rottweiler and a cat. 77. 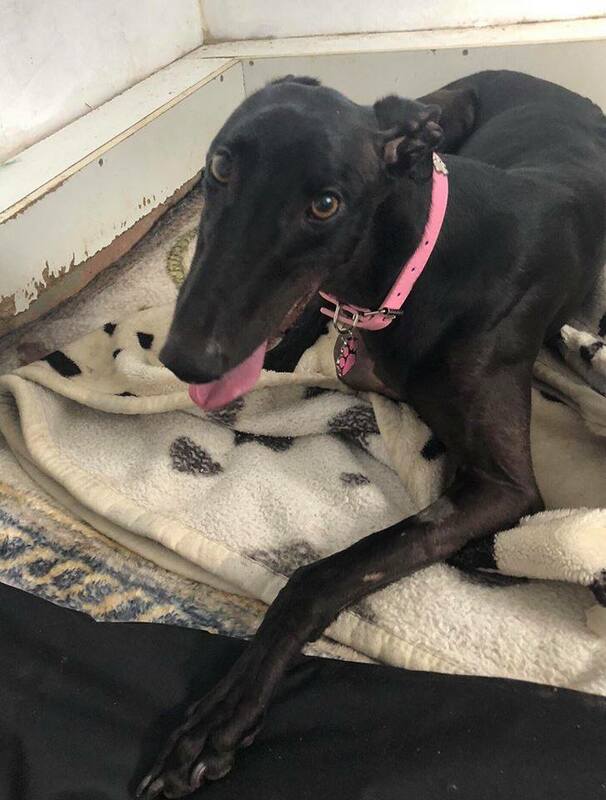 Jodielottie (Lottie) born 10 February 2015, rehomed 28 July 2019 to a couple near Brigg with 2 other greyhounds. 78. Monemore Rosie (Bambi) born 22 February 2016, rehomed 30 July 2018 to a lady in Cheshunt. 79. Rock The Jespah (Jespah) born 8 April 2014, rehomed 1 August 2018 to a family in Mill Hill. 80. Glenside Rosey (Raffa) born 10 July 2015, rehomed 4 August 2018 to a couple in Croydon. 81. Hack up Boy (Murphy) born 12 March 2014, rehomed 6 August 2018 to a couple in Lincoln with a three year old boy and a cat. 82. 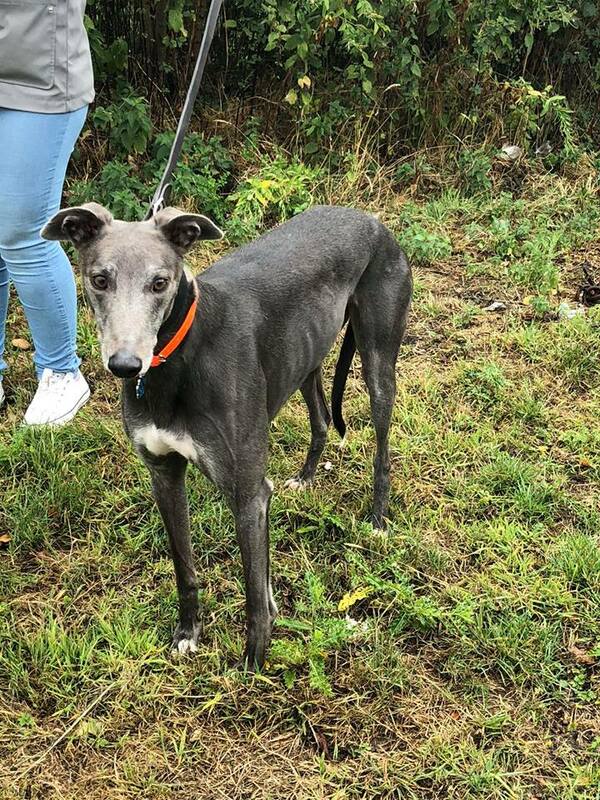 Snooty Lass (Lass) born 20 September 2014, rehomed 9 August 2018 to a lady near Immingham. 83. Hesa Wizard (Harry) born 5 April 2014, rehomed 11 August 2018 to a couple in Reading. 84. Buddy Brown (Roscoe) born 20 October 2012, rehomed 11 August 2018 to a lady in Oxford. 85. Barra Juliet (Juliet) born 27 August 2015, rehomed 13 August 2018 to a family in Boston. 86. Mohane Jasper (Duke) born 1 November 2014, rehomed 15 August 2018 to a man in Sleaford. 87. Alex May Star (Lexi) born 9 February 2015, rehomed 24 August 2018 to a couple near Lincoln with one other greyhound. 88. 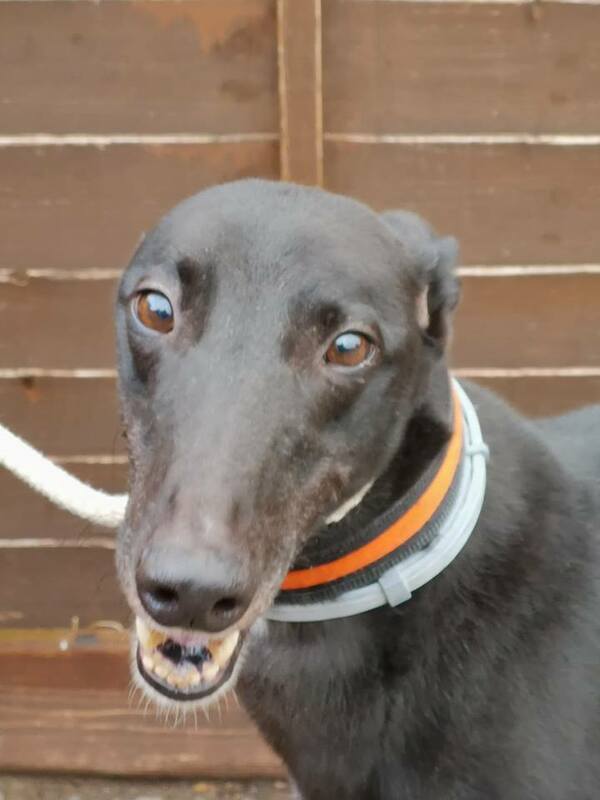 Rush Hour (Rushy) born 12 April 2015, rehomed 27 August 2018 to a couple near Doncaster with one other greyhound. 89. Dinner Carolina (Carolina) born 21 August 2013, rehomed 27 August 2018 to a couple in Boston. 91. Ancalagon (Thunder) born 18 August 2014, rehomed 27 August 2018 to a family in Sleaford with a Jack Russell. 92. Run Buddy Run (Buddy) born 1 January 2014, rehomed 27 August 2018 to a man in Scunthorpe. 93. Ballymac Laurel (Izzy) born 2 January 2014, rehomed 31 August 2018 to a couple near Lincoln. 94. Golovkin (Shady) born 3 November 2013, rehomed 31 August 2018 to a family in Watford with a Bassett Hound. 95. Always Thirsty (Thirsty) born 2 August 2014, rehomed 3 September 2018 to a family near Sheffield. 96. Head Iton Oliver (Oliver) born 27 June 2013, rehomed 3 September 2018 to a couple near Spalding with 2 yr old daughter and a pug. 97. 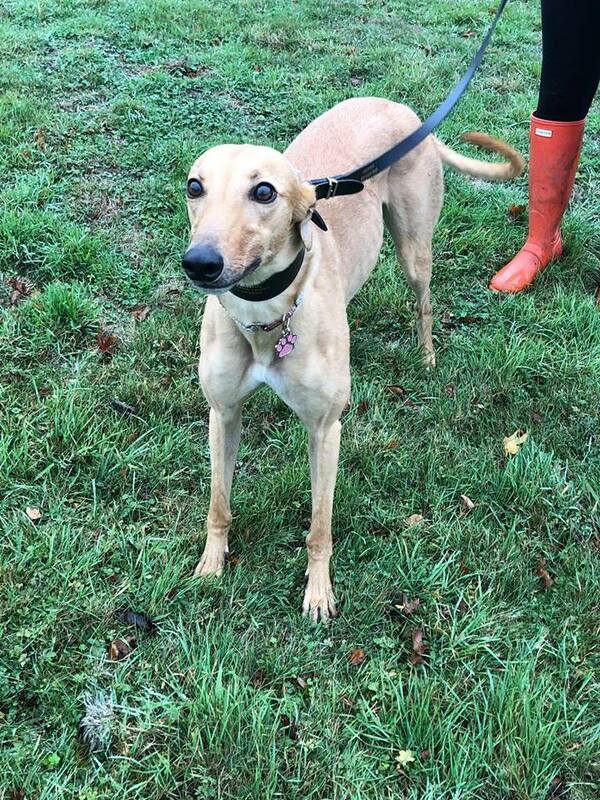 Towstar Honey (Honey) born 8 June 2016, rehomed 4 September 2018 to a family near Sheffield with a lurcher. 98. 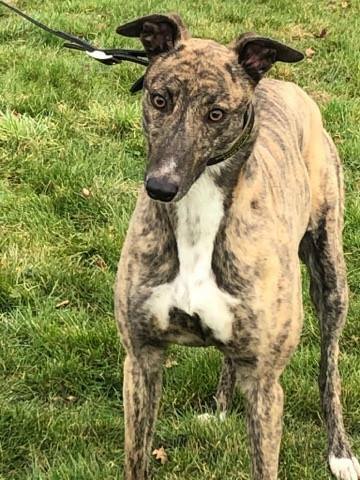 Primo Teddy (Teddy) born 9 February 2014, rehomed 7 September 2018 to a family in Newbury with one other greyhound. 99. 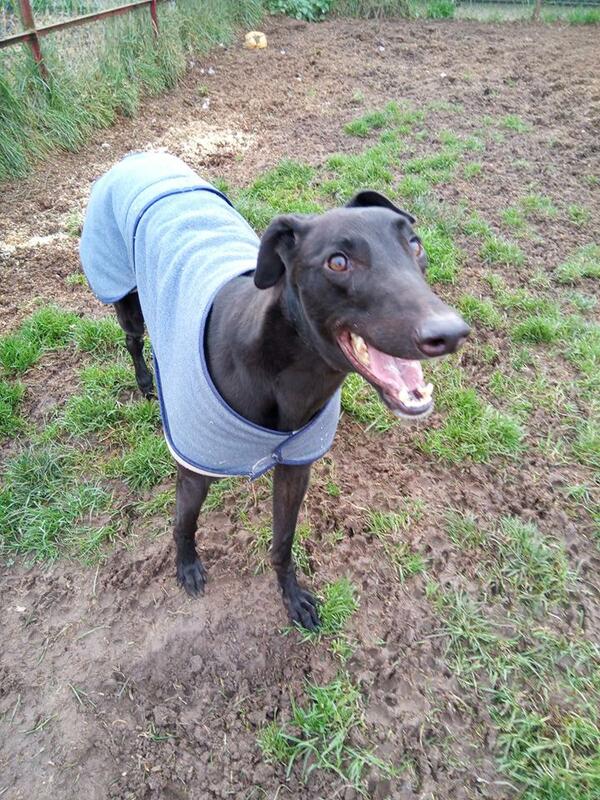 Sporting Hero (Hero) born 3 December 2015, rehomed 8 September 2018 to a Nottingham couple with a spaniel and a greyhound. 100. 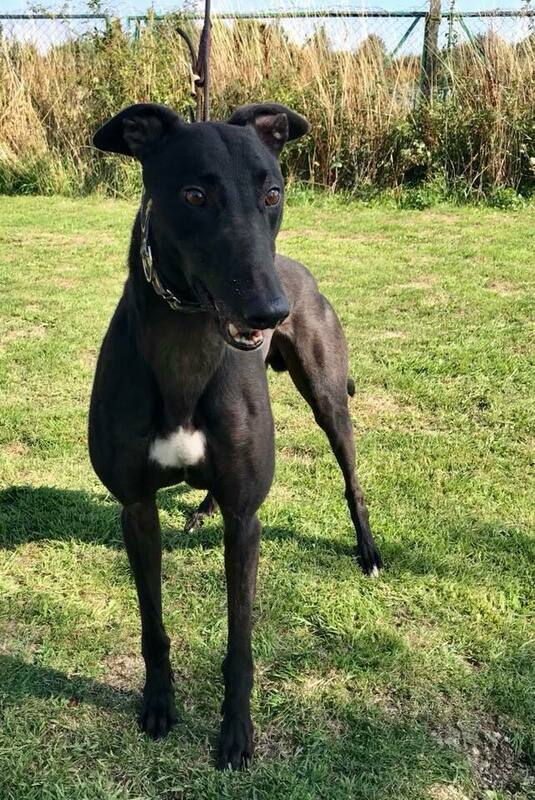 Balboa Buzz (Orion) born 1 June 2014, rehomed 8 September 2018 to a couple near Spalding with one other greyhound. 101. Whole Lotto Luck (Lotto) born 20 August 2013, rehomed 8 September 2018 to a family in Hatfield with a cat. 103. Hoo Har (Harry) born 14 October 2015, rehomed 16 September 2018 to a family in Sleaford with two other greyhounds and a spaniel. 104. Geelo Vic (Will) born 17 August 2015, rehomed 16 September 2018 to a family near Wisbech with a German Shepherd and 2 cats. 106. Castleview Comet (Comet) born 25 September 2013, rehomed 23 September 2018 to a couple in Shepherds Bush with two cats. 107. Kilbreedy Anna (Anna) born 7 March 2014, rehomed 24 September 2018 to a man from Rushden. 108. Sonny Da Boy (Sonny) born 16 September 2014, rehomed 27 September 2018 to a lady in Bracknell. 109. Special Groove (Rex) born 15 May 2016, rehomed 5 October 2018 to a lady and her adult niece in Walthamstow. 110. Dunham Lord (Lord) born 1 October 2013, rehomed 7 October 2018 to a lady near Goole. 111. 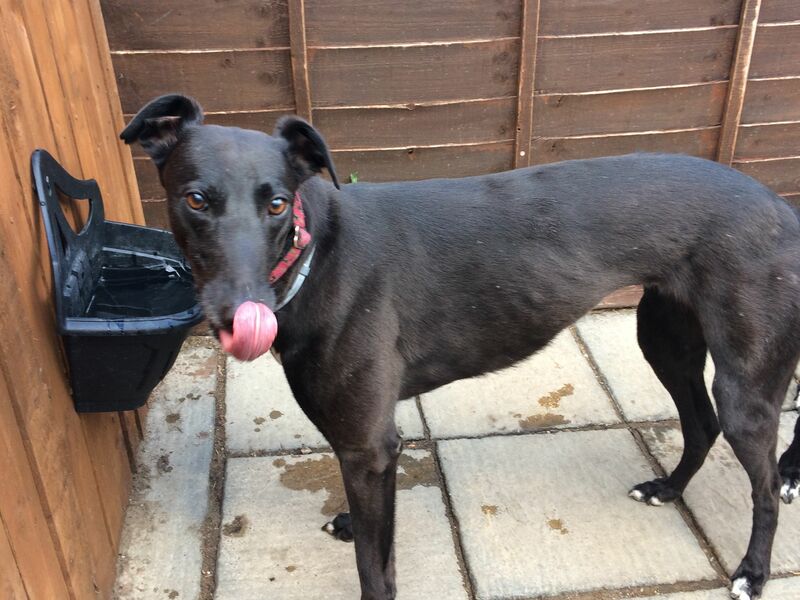 Droopys Eleven (Evie) born 10 February 2014, rehomed 7 October 2018 to a couple in North Hykeham. 112. 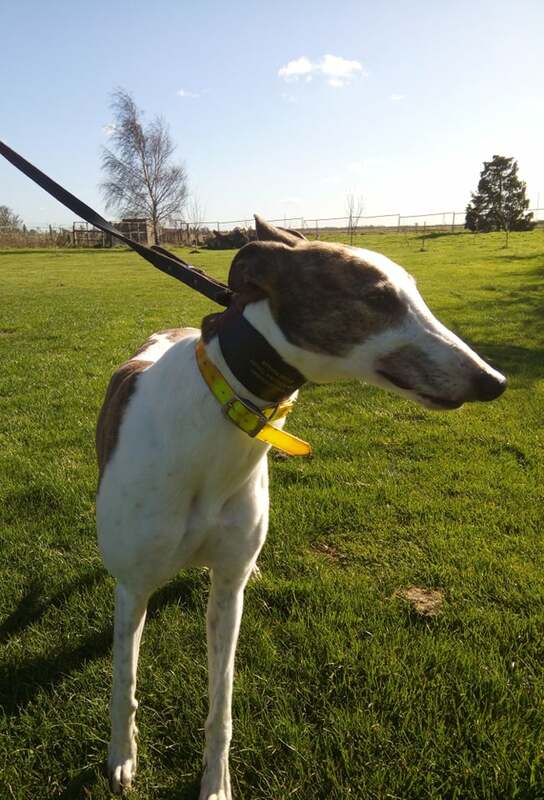 Creamery Daisy (Daisy) born 21 July 2016, rehomed 11 October 2018 to a couple near Lincoln with 2 year old son and a lurcher. 113. Elmer Fudd (Badger) born 1 November 2009, rehomed 13 October 2018 to a couple in Immingham with 3 other greyhounds and 7 cats. 114. 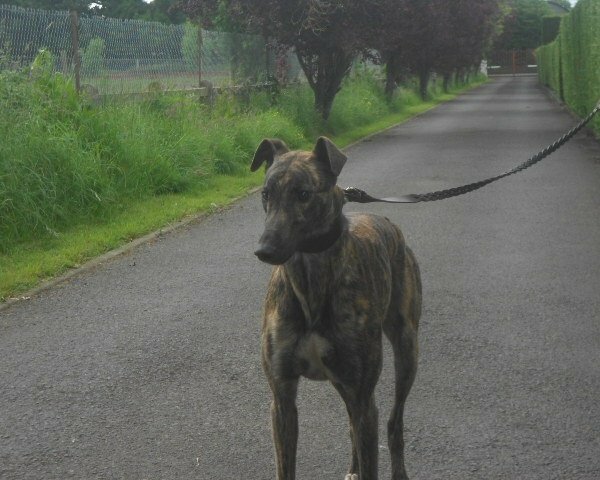 Kingsmill Key (Sox) born 19 July 2011, rehomed 13 October 2018 to a couple in Immingham with 3 other greyhounds and 7 cats. 115. Savana Biddy (Biddy) born 20 July 2016, rehomed 18 October 2018 to a couple in Skegness. 116. 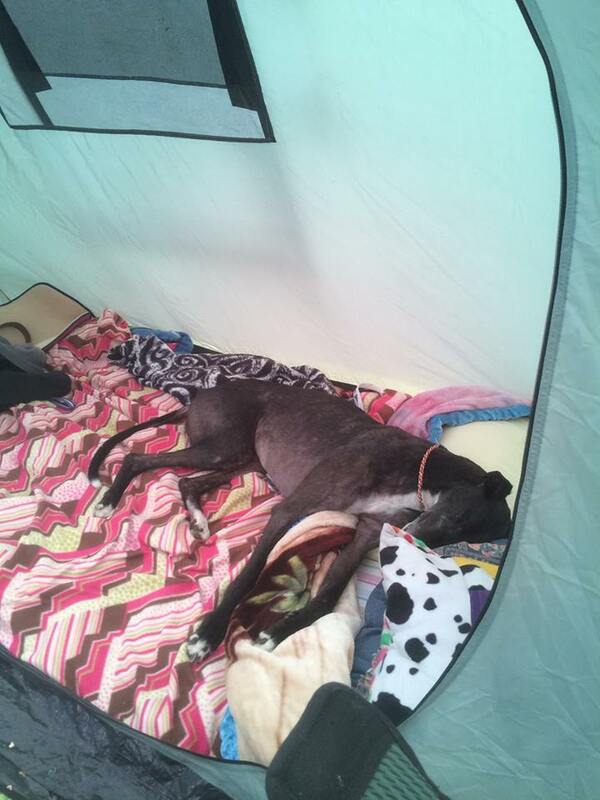 Castlepalooza (Lulu) born 29 September 2015, rehomed 19 October 2018 to a couple in Hemel Hempstead with one other greyhound. 117. Dunham Owen (Odin) born 3 October 2013, rehomed 22 October 2018 to a couple in Ancaster. 118. Cloncunny Bound (Skippy) born 22 September 2012, rehomed 25 October 2018 to a couple near Grantham with a 5 year old son. 119. Lendmeyourpencil (Penny) born 7 August 2013, rehomed 25 October 2018 to a couple in Sheffield with an adult son and 4 cats. 120 Roman Recruit (Roman) born 12 July 2014, rehomed 27 October 2018 to a lady in Lincoln. 121. Head Iton Stubby (Stubby) born 27 June 2013, rehomed 28 October 2018 to a family near Boston. 122. Swift Magnum (Magnum) born 12 August 2013, rehomed 28 October 2018 to a family in Welwyn. 123. Pickinthechicken (Gabby) born 15 April 2016, rehomed 28 October 2018 to a family in Didcot. 124. Jitterbug (Jazz) born 17 September 2014, rehomed 2 November 2018 to a lady near Oxford. 125. Carmac Mo (Polly) born 18 September 2013, rehomed 3 November 2018 to a family in North Lincolnshire with 4 cats. 126. Burgess Rokocoko (Roko) born 11 March 2016, rehomed 3 November 2018 to a family in Walthamstow with a greyhound and a terrier. 128. Tracles Star (Treacle) born 9 February 2015, rehomed 4 November 2018 to a couple near Grimsby. 129. Whatsapper (Fern) born 16 September 2014, rehomed 5 November 2018 to a couple in Amersham. 130. Mustang Abby (Willow) born 5 June 2016, rehomed 7 November 2018 to a family in Gainsborough. 131. 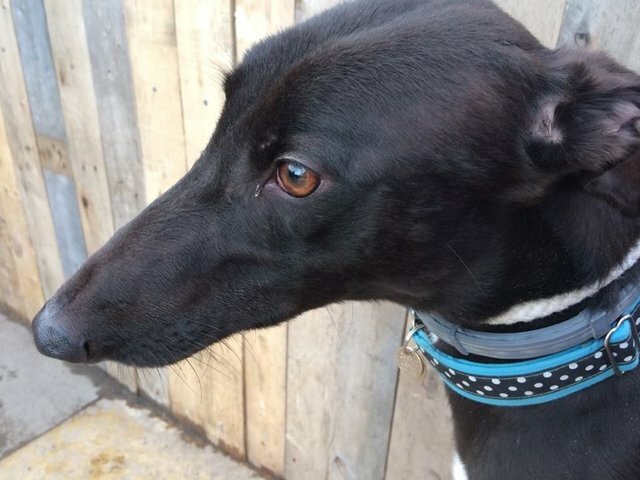 Special Sennen (Margot) born 29 March 2015, rehomed 9 November 2018 to a family in Walthamstow with one other greyhound. 132. 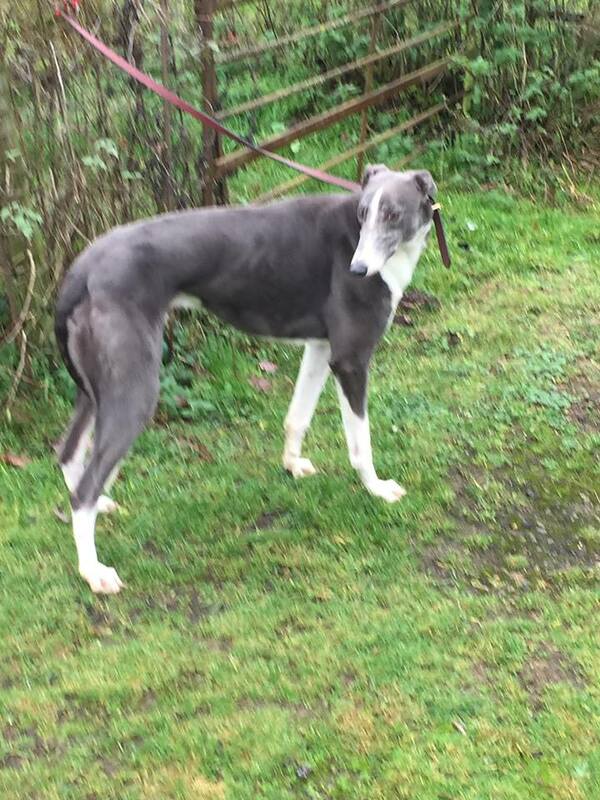 Killavarrig Ray (Gray) born 6 May 2015, rehomed 10 November 2018 to a lady in Hatfield with a young daughter. 133. Aero Harrison (Harrison) born 1 February 2012, rehomed 14 November 2018 to a lady in Lincoln. 134. Townside Rebel (Ruby) born 9 October 2015, rehomed 15 November 2018 to a family near Basingstoke. 135. Ballymac Duchess (Ellie) born 1 April 2016, rehomed 23 November 2018 to a family near Retford. 136. Hollywood Diva (Holly) born 9 December 2016, rehomed 24 November 2018 to a family in Hertfordshire with 2 cats. 137. Swift Tresco (Tresco) born 1 September 2014, rehomed 25 November 2018 to a couple in Mablethorpe. 138. 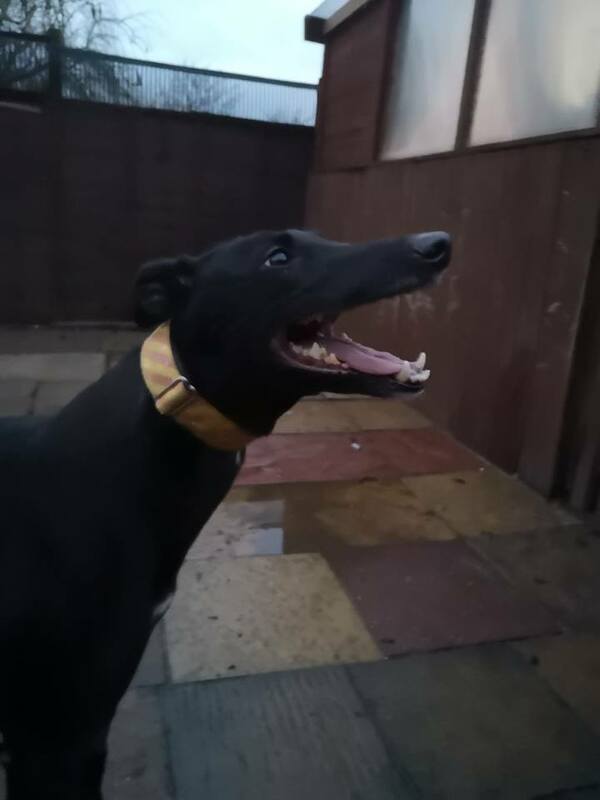 Ballymac Nuala (Jazz) born 23 July 2013, rehomed 29 November 2018 to a couple in Grimsby with one other greyhound. 139. Holdem Apache (Tonto) born 2 December 2012, rehomed 2 December 2018 to a couple in North Lincolnshire. 140. 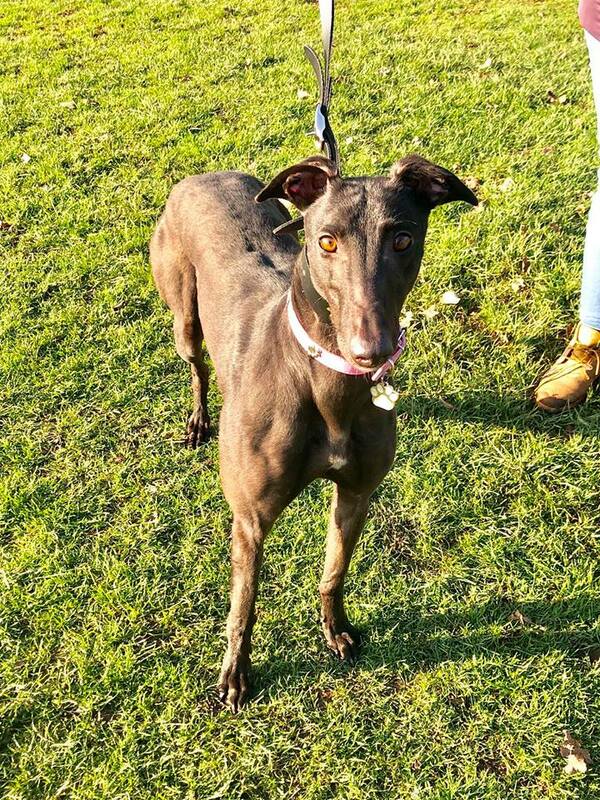 What Fun Hattie (Hattie) born 21 January 2013, rehomed 4 December 2018 to a lady near Holbeach with a lurcher and a crossbreed. 141. Slick Skyfall (Sky) born 13 October 2011, rehomed 5 December 2018 to a couple near Gainsborough with a Setter. 142. Myella Flash (Flash) born 29 July 2016, rehomed 9 December 2018 to a couple in Grantham with 2 adult sons. 143. 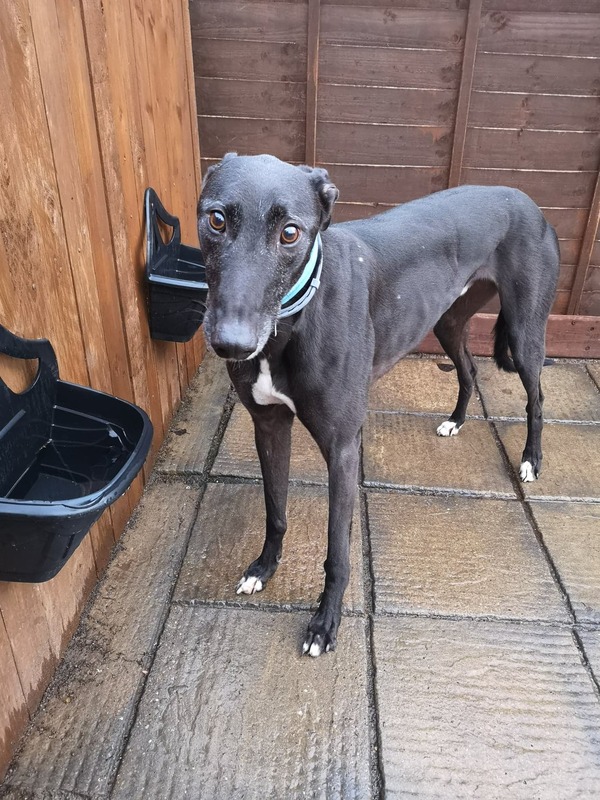 Slaneyside Nancy (Lacey) born 19 August 2014, rehomed 9 December 2018 to a family in Grantham with one other greyhound. 145. Bombay Billy (Billy) born 3 August 2013, rehomed 12 December 2018 to a family near Wycombe. 146. 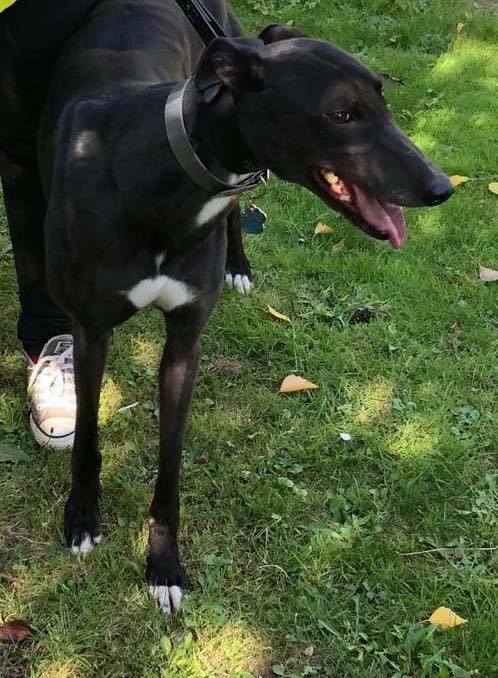 New Order (Tommy) born 1 July 2014, rehomed 14 December 2018 to a lady near Spalding with three other greyhounds. 147. Saint Nick (Nicky) born 9 December 2016, rehomed 17 December 2018 to a family in Walthamstow with two cats. 148. Liosgarbh Tim (Buddy) born 15 February 2015, rehomed 20 December 2018 to a family in Walthamstow. 149. Canine Queen (Nelly) born 3 November 2016, rehomed 21 December 2018 to a family near Lincoln with two other dogs and two cats. 150. Kooga Kipper (Kipper) born 1 July 2012, rehomed 21 December 2018 to a family in Brigg with one other greyhound. 151. 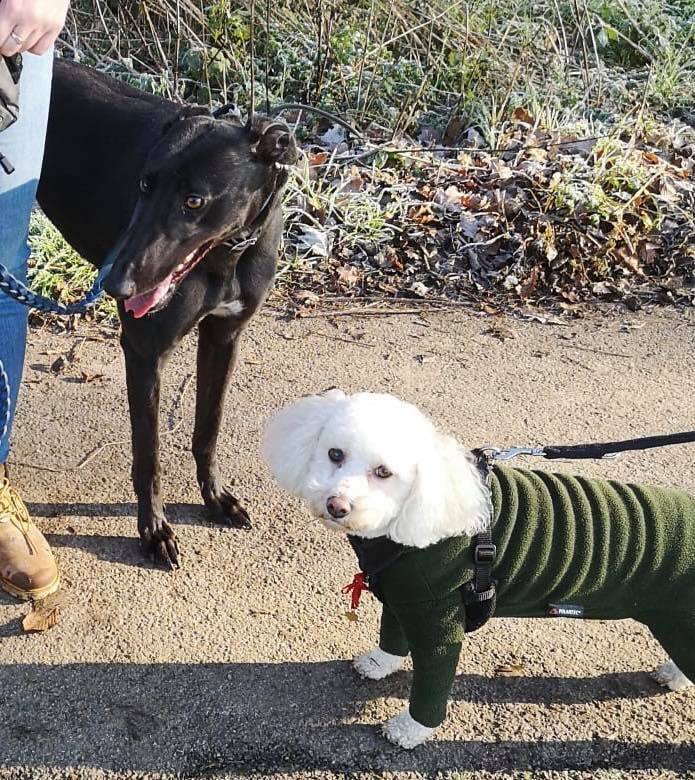 Droopys Avenue (Duffy) born 21 June 2016, rehomed 22 December 2018 to a family near Stamford with a Spaniel. 152. La Dash Hendog (Katie) born 11 August 2014, rehomed 22 December 2018 to a man in Grimsby with one other greyhound. 153. Peaceful Ellsa (Elsa) born 7 August 2014, rehomed 24 December 2018 to a couple near York who already have her litter brother. 154. Sunset Olympian (Sunny) born 3 March 2013, rehomed 27 December 2018 to a lady near Grantham with two cats. 156. Born To Please (Stanley) born 20 June 2015, rehomed 30 December 2018 to a family in Welton with a pug. 1. Treble Trigger (Mac) born 3 January 1995, rehomed 22 January 2001 to Kevin and Mandy Stow in Lincoln. 3. Estark (Star) born 1 September 1997, rehomed 27 January 2001 to a couple in Tattershall. 4. Builders Buddy (Bonnie) born 1 July 1995, rehomed 27 February 2001 to a couple near Lincoln. 5. Nice Display (Sandy) born 12 February 1995, rehomed 17 March 2001 to a couple in Lincoln. 6. Parkill Miss (Mya) born 19 September 1994, rehomed 31 March 2001. 7. Martins Ryan (Mouse) born 14 November 1997, rehomed 13 May 2001. 8. Heather Sport (Harvey) born 24 March 1994, rehomed 23 May 2001 to a couple in Worksop with a cat. 10. Villiers Rebel (Mickey) born 2 August 1997, rehomed 17 June 2001 to a couple near Lincoln. 11. 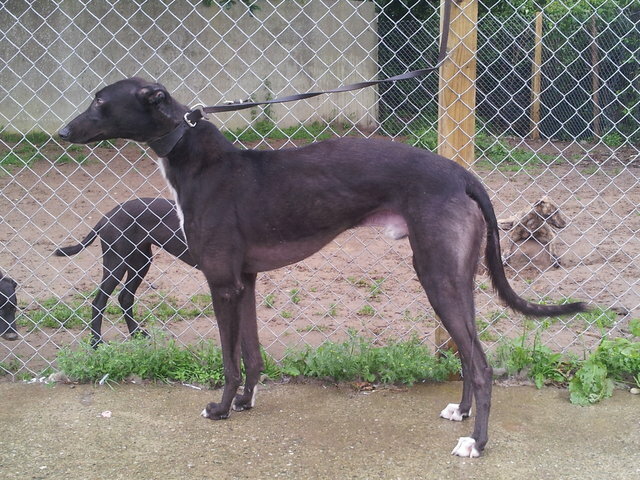 Any Get Out (Jake) born 17 March 1993, rehomed 22 June 2001 to a couple in Lincoln with one other greyhound. 12. Groine Pond (Blue) born 20 October 1995, rehomed 4 July 2001 to a family near Horncastle. 13. Victory Brindle (Darsie) born 4 December 1993, rehomed 16 July 2001 to a couple in Market Rasen. 14. Hes Electric (Sparky) born 14 March 1996, rehomed 21 July 2001 to a couple in North Hykeham. 15. Canny Glow (Glow) born 1 December 1996, rehomed 18 August 2001 to a couple in Lincoln. 16. Jay Four Hats (Poppy) born 14 May 1997, rehomed 18 August 2001 to a man in Scampton. 17. Move Over Monty (Monty) born 8 April 1998, rehomed 4 September 2001. 19. Kings Tipp (Lucky) born 11 August 1998, rehomed 9 September 2001 to a couple in Lincoln. 20. Ghostly Morgan (Morgan) born 7 February 1998, rehomed 16 September 2001 to a family near Lincoln. 23. Rivington Chill (Mouse) born 10 August 1998, rehomed 29 September 2001 to a family in Lincoln. 24. Leap Phantom (Frog) born 11 October 1996, rehomed 1 October 2001 to a lady in Retford. 25. Glengar Super (Bess) born 8 June 1995, rehomed 22 October 2001 to a man near Grimsby. 26. Ainvilla Oak (Amy) born 27 April 1998, rehomed 31 October 2001 to a family in Bishop Norton. 27. Deneview Ebony (Ebony) born 23 June 1995, rehomed 15 November 2001 to a lady in Scunthorpe. 28. Airfield Spirit (Spirit) born 5 November 1996, rehomed 16 November 2001 to a family near Lincoln. 29 & 30. Denby Girl (Denby) and Travellers Joy (Joy) both born 10 July 1993, rehomed 18 November 2001 to a couple at Dunham on Trent. 31. Lets Go Rodrigo (Rodney) born 17 November 1996, rehomed 9 December 2001 to a couple near Ruskington. 32. Sir Tuppence (Fergal) born 3 July 1994, rehomed 17 December 2001 to a lady in Lincoln. 33. Canny Melody (Merlin) born 13 December 1996, rehomed 23 December 2001 to a couple in Sleaford. 34. Trail Of Terror (Sky) born 22 November 1998, rehomed 28 December 2001 to a couple in Leicestershire. 35. Sadies Girl (Shelley) born 10 July 1998, rehomed 31 December 2001 to a family near Lincoln. 1. Quigleys Cora (Lady) born 7 August 1991, rehomed 25 January 2000 to a lady in Nettleham. 2. Kuda Missy (Missy) born 10 November 1994, rehomed 16 February 2000 to a couple in Lincoln. 4. Chorisbar (Fergal) born 6 November 1996, rehomed 18 March 2000 to a man near Lincoln. 5. Stan’s Delight (Danny) born 1 April 1989, rehomed 18 April 2000 to a lady in London. 8. Black Velvet (Cam) born 6 September 1998, rehomed 13 May 2000 to a couple near Retford. 10. Lanas Wishes (Lana) born 10 July 1997, rehomed 28 May 2000 to a couple in Lincoln. 12. Funny Visit (Sally) born 1 October 1993, rehomed 6 June 2000 to a lady near Worksop. 13. Edcol Delta (Delta) born 8 September 1996, rehomed 14 July 2000 to a couple near Lincoln. 14. Bohermore Gem (Ginger) born 14 April 1994, rehomed 1 August 2000 to a family near Lincoln. 15. Richard The Monk (Winnie) born 20 September 1995, rehomed 16 October 2000 to a couple in Lincoln. 16. Sarahslittlelpa (Dottie) born 19 August 1995, rehomed 18 October 2000 to a lady near Cambridge. 17. Unregistered Female (Molly) born 12 May 1997, rehomed 30 November 2000. 18. Barneyarric (Tess) born 9 January 1995, rehomed 9 December 2000 to a couple near Metheringham. 1. Manhattan Gem (Gem) born 6 July 1992, rehomed 1 January 1999 to a lady near Metheringham. 2. Team Talk City (Ash) born 15 December 1996, rehomed 10 January 1999 to a couple in Grimsby. 3. Micro Girl (Matilda) born 8 October 1995, rehomed 18 January 1999 to a couple near Louth. 4. Team Talk Lass (Abby) born 15 December 1996, rehomed 23 January 1999 to a family near Market Rasen. 5. Gaelic Run (Flynn) born 7 September 1995, rehomed 26 January 1999 to a lady in Sleaford. 6. Short Ace (Lucky) born 11 May 1989, rehomed 29 January 1999 to Kevin and Mandy Stow in Lincoln. 7. Roeview Mist (Misty) born 15 August 1996, rehomed 14 February 1999 to a lady near Market Rasen. 8. Mullinacross Lil (Lil) born 27 September 1992, rehomed 4 March 1999 to a lady in Dunholme. 9. Boden Mick (Jet) born 5 July 1995, rehomed 1 April 1999 to a lady near Gainsborough. 10. Emmets Dream (Lucy) born 7 March 1990, rehomed 15 April 1999 to a man in Lincoln. 11. Bridge Lad (Laddie) born 28 August 1996, rehomed 3 May 1999 to a lady near Binbrook. 12. Tonto (Tonto) born 21 March 1996, rehomed 4 May 1999 to a family near Rotherham. 13. Unregistered female (Sophie) born 2 December 1997, rehomed 6 May 1999 to a couple near Metheringham. 14. Frankie Goes Too (Frankie) born 11 April 1996, rehomed 25 June 1999 to a couple in Cherry Willingham. 15. Mick The Lip (Walshy) born 8 November 1994, rehomed 25 June 1999 to a couple in Cherry Willingham. 16. Team Talk United (Torq) born 15 December 1996, rehomed 27 June 1999 to lady near Lincoln. 17. Newbourne Lady (Lucy) born 22 October 1994, rehomed 5 July 1999 to a couple near Lincoln with one other greyhound. 18. Lead On Jack (Jack) born 5 May 1995, rehomed 9 July 1999 to a couple in Lincoln. 19. Sneaky Karen (Dylan) born 15 May 1996, rehomed 10 July 1999 to a lady and her daughter in Lincoln. 20. Destiny Blue (Sheba) born 5 November 1996, rehomed 12 July 1999 to a couple from Sausthorpe. 21. Welcome Stranger (Sammy) born 6 November 1996, rehomed 5 August 1999 to a couple near Louth with one other greyhound. 22. Frisby Frontier (Frisby) born 8 June 1995, rehomed 1 October 1999 to a family in Scunthorpe. 23. Bridgeview Chief (Charlie) born 1 July 1995, rehomed 3 October 1999 to a family in Waddington. 24. Nevin Princess (Maggie) born 29 July 1993, rehomed 11 November 1999 to a couple near Woodhall Spa. 25. Unregistered Female (Holly) born 2 July 1998, rehomed 20 November 1999 to a couple near Lincoln. 26. Simple Highway (Kia) born 6 July 1995, rehomed 5 December 1999 to a couple in Newark. 27. Westwood Diamond (Bosun) born 15 May 1996, rehomed 24 December 1999 to a couple in Waddington. 28. Mint Humbug (Honey) born 25 January 1997, rehomed 24 December 1999 to a couple in Waddington. 1. Lone Dynamite (Sky) born 1 September 1992, rehomed 26 November 1996 to charity founders Kevin and Mandy Stow in Lincoln. 2. Sheeaun Rose (Jemma) born 23 February 1995, rehomed 25 September 1998 to a lady near Lincoln. 3. West End Weasle (Paddy) born 1 January 1995, rehomed 2 December 1998 to a couple near Lincoln. 4. Storm Drum (Molly) born 12 May 1992, rehomed 16 December 1998 to a couple in Lincoln. 5. Clon Dubh (Winston) born 14 May 1992, rehomed 19 December 1998 to a lady near Market Rasen.